ARENACLEAR is an ecologically & environmentally safe soil conditioner. You should NOT harrow your arena until you have completed the application procedure, if you do, you will see dust when you ride, because you haven’t treated the entire riding footing with ARENACLEAR. Note:* ARENACLEAR should be applied when the ground temperature is 50 degrees or warmer. If you apply ARENACLEAR when the temperature is less than 50 degrees, it will take longer to work. PLEASE make sure the surface you are treating is dry when you begin the application process. One gallon will treat at least 10,000 sq. ft. NOTE: You can ride on your arena after the first application of A. C. & water, however, DON’T DRAG ARENA until all the water applications are completed. Step 1. Drag your arena prior to applying ARENACLEAR. dial to the 1oz setting. Turn water on and begin applying the product to your arena surface. Spray as fast as you can (you only want to get the product on the surface of the arena, you don’t want to saturate the surface). This application will cover at least 2,500 sq. ft. When the container is empty, continue to water the area you have treated for approximately 2-3 minutes (just to get the product off the surface of the arena footing). Repeat this process until you have treated your entire arena. Each quart of ARENACLEAR, will treat approximately 2,500 sq. ft. DO NOT DRAG YOUR ARENA. Step 3. Every other day, (for 3 days) water your entire arena 5-10 minutes with plain water or until it starts to puddle, then STOP, this will push ARENACLEAR. down and let it work on your footing. DO NOT DRAG. Step 4. Once you have completed this wet/dry watering process, water one last time for 10-15 minutes, this will make sure the product treats the entire footing to a depth of 3-4 inches. Step 5. After completion of these steps you can now DRAG YOUR ARENA. Step 6. 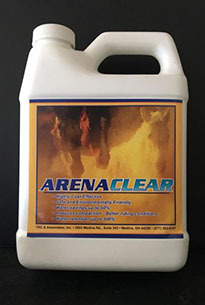 When you see a dust cloud sitting at 2.5 – 3.5 ft. and not falling, it is time to water your arena and re-activate ARENACLEAR. ***When you notice that you are watering about the same as you were prior to applying ARENACLEAR (1/year or more) it is time to re-apply ARENACLEAR to your arena. The only difference between the indoor application and the outdoor application is the number of times you will have to apply ARENACLEAR. Since Mother Nature adds new dust & dirt, you may need to apply ARENACLEAR sooner than once a year. You can determine this by seeing how much you are watering. However, ARENACLEAR should last at least a year under normal circumstances. Step 1.Fill tank (whatever size you have) with 1/3 water, then add ARENACLEAR, then fill the remainder of the tank with water. Begin spraying your arena, making sure to cover the entire 10,000 sq. ft. with the mixture. Step 2.Fill the tank with plain water and water the entire arena to get the product off the top of the surface of the arena. Step 3. Water the arena with plain water every other day for 3 watering’s (2/tanks per water day). Step 4. Water the arena with plain water every other day for 2 watering’s (3/tanks per water day). This will complete the wet/dry watering application. APPLICATION FOR MUD:(One gallon will treat 1,000 – 4,000 sq. ft. depending on the depth of the mud). Watering instructions – you will fill your hose end sprayer with ARENACLEAR, set your dial to the following settings. Once you have applied ARENACLEAR to the desired area, water with plain water for 10-15 minutes. Every other day water with plain water for 10-15 minutes or until it starts to puddle (then stop) (3-4 watering days with dry days in-between. If it rains, let the rain be your watering day. Finally, water 15-20 minutes for 2 days with a dry day in-between. This completes your watering application. Every time it rains it will push ARENACLEAR down to the desired depth and breakup the barrier that is keeping the water from penetrating down & creating mud. ***If you have any questions on any of the application methods, please feel free to contact me and I will walk you thru the application process for dust or mud.